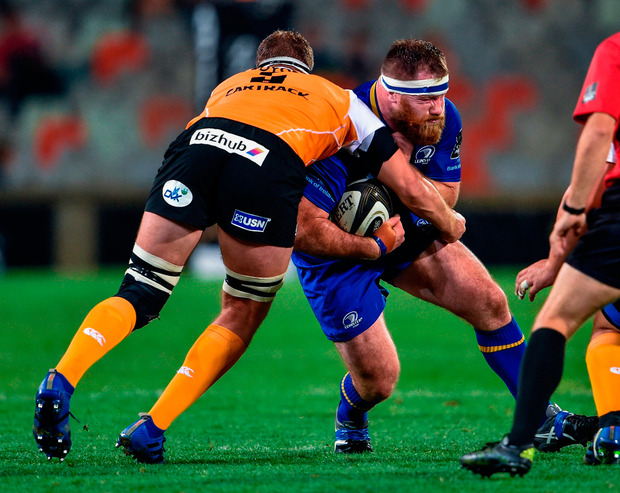 Leo Cullen has promised that Leinster will do an "extensive review" of their incident-packed two-match tour of South Africa after it concluded in a heavy defeat to the Cheetahs in Bloemfontein last night. Whether it was the visa issue that cost him the services of his captain Isa Nacewa and scrum-half Jamison Gibson-Park for the win over the Southern Kings, the incident that led to Cian Healy being asked to leave a flight from Port Elizabeth to Cape Town, the travel arrangements or the time spent adapting at altitude before this defeat - the coach says all members of the travelling party must learn from the experience. And last night's game was a humbling one for a side who were bullied at times by a Cheetahs team who produced their best performance of the campaign to date, securing a bonus point and denying the Irish side any of the spoils. That's despite a hat-trick from Barry Daly that set them up for a grand-stand finish that could have earned them two bonus points, but instead they finished the game under their own posts after Luther Obi took an intercept try the length of the field. Citing his team's ill-discipline as a key factor, the coach was disappointed. "We were a little bit off," Cullen said. "We knew the Cheetahs would come hard at us and we allowed them to build that lead and made life more difficult for ourselves than we needed to. "They were able to score three, six, nine, 12 points and we didn't manage the ball particularly well, so we were a little bit off and gave ourselves too much to do. We lose James (Tracy) to the sin-bin and leak another try with 14. "Our penalty count was what got us into trouble, and then we ran out of time. We were pushing at the end when we gave away the intercept. Two points were on offer but the intercept was the end of it. "Plenty of learnings from this trip. "There's always a chance (of a poor display) with the preparation we had, we were limited with the squad and normally train with bigger numbers. "That's the challenge, we'll have to look at it for when we come over here again. "It's a really interesting challenge, it's so far away from our base and being away for two games is not something we're used to. "We'll do an extensive review of the trip, but we have three wins out of four and it's a long season." Cullen confirmed that Nacewa is unlikely to play against Edinburgh next week after damaging his calf after 15 minutes and the side was visibly weakened by his absence. Leinster were 6-5 down when he went off but ended up 31-5 behind before they fought back to give themselves a fighting chance of leaving with something tangible. Penalties from Ernst Stapelberg sandwiched Daly's first try from a fine cut-out pass from Noel Reid, but Ross Byrne missed the conversion and then sent an easier penalty wide before his opposite number edged his side back in front. With Nacewa off, the pressure mounted and Josh van der Flier brilliantly robbed Torsten van Jaarsveld just as they were building some pressure in the '22'. Stapelberg added another, punishing Jack Conan for not rolling away. The visiting side were under pressure and struggling to establish field position and Stapelberg punished further breakdown ill-discipline. Another crucial intervention from Van der Flier prevented further damage as Leinster struggled to cope with the powerful carries from No 8 Ouopa Mohoje and brilliant winger Makazola Mapimpi. Leinster looked to take advantage and when Gibson-Park turned down points and went quickly, Rory O'Loughlin found space on the outside and fed Carbery who was hauled down close to the line. 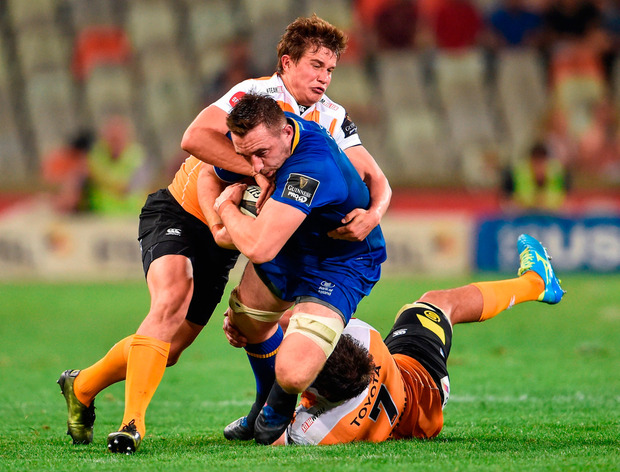 Leinster couldn't protect the ball, however, and the locals were able to clear the danger. A Michael Bent knock-on handed them a scrum on their own 10m line and they didn't need to be asked twice, marching the blue scrum backwards before Tian Meyer broke free, fed captain Francois Venter who broke the Leinster cover, drew Carbery and put William Small-Smith over for the try. Stapelberg converted to make it 19-5 and his side took their two-score lead into half-time. 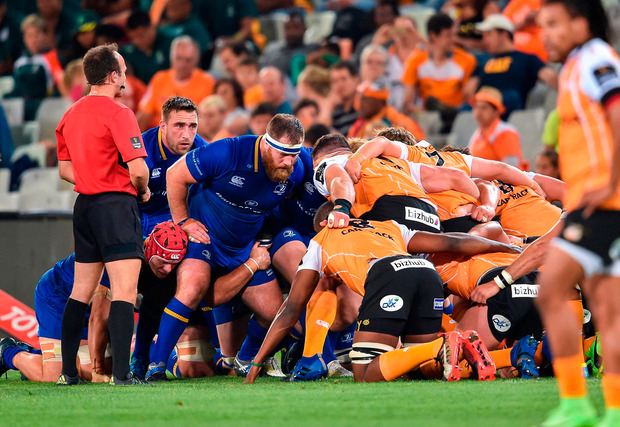 He turned down an opportunity to extend it just after the break as Leinster's poor discipline continued into the second half and James Tracy paid the price for a no-arms tackle on Charles Marais that led to a yellow card and a maul try for Van Jaarsveld. Stapelberg sent the conversion wide but a high tackle from Bent - Leinster fourth penalty concession in six second-half minutes - robbed his side of a chance to hit back and instead it was the home side who went chasing the bonus point. Byrne prevented a certain fourth try with a clever hand as Rosco Specman put Venter away, but the home fans didn't have to wait long and Ox Nche powered through Rhys Ruddock to score. Stapelberg made no mistake this time around and it was damage limitation time for the beleaguered tourists. Daly hit back with a similar try to his first to narrow the gap, this time O'Loughlin found him in space and Byrne converted to narrow the gap further. Daly almost got another as the tourists finally started to put some phases together, but a good tackle from Nche denied him, but the UCD man managed his hat-trick minutes later as the home side faded and he stepped inside the cover and finished well. 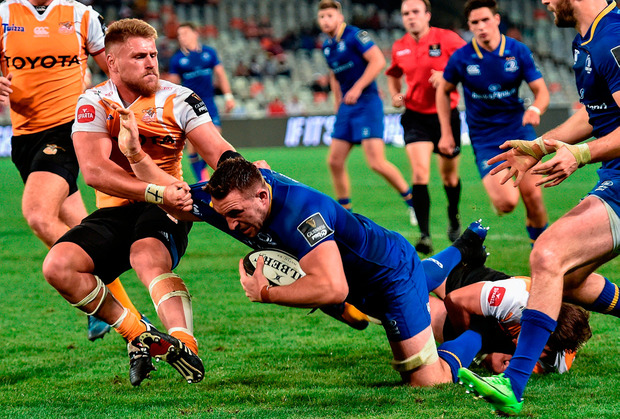 Byrne's conversion meant one more try would earn Leinster a scarcely-deserved two bonus points, but they couldn't manage it despite a concerted spell of pressure in the Cheetahs' territory. A penalty as the clock ticked towards 80 handed them one last chanceon the '22', but Cathal Marsh's pass was picked off by Obi and the game was up as he raced clear and even managed a somersault when touching down. It was that kind of night for Leinster. CHEETAHS - S Petersen; R Specman, F Venter (capt), W Small-Smith (N Lee 64), M Mapimpi; E Stapelberg, T Meyer (S Venter 64); C Marals (O Nche 51), T van Jaarsveld (J du Toit 80), T Botha (J Coetzee 46); J Basson, R Hugo (R Bernardo 74); P Schoeman, H Venter, O Mahoje (J Pokomela 62). LEINSTER - J Carbery; D Kearney, N Reid, I Nacewa (capt) (R O'Loughlin 16), B Daly; R Byrne (C Marsh 74), J Gibson-Park (N McCarthy 61); C Healy (P Dooley 51), J Tracy (S Cronin 56), M Bent (A Porter 51); R Molony, M Kearney (R Ruddock 51); J Murphy (M Deegan 71), J van der Flier, J Conan (M Deegan 70). REF - M Adamson (Scotland).